Isn't it great when you find a little slice of joy, every time you take a road trip? 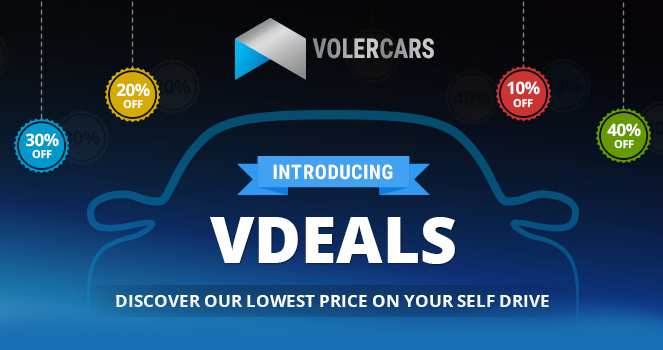 That's why, Volercars is introducing Vdeals - Super value deals, exciting offers, flat discount coupons and much more! Now you can pack your bags and plan a perfect road trip anytime and you don't have to wait for special occasions for discounts and offers anymore. Here is how Vdeal works? Select Vdeals option from the menu and discover super value deals, exciting offers and flat discount coupons. Choose your city to discover deals around you. Explore new deals every day! Lowest price guaranteed on every booking with us. Choose the deal you want to purchase and click on the "Apply" button. Step 5 - Enjoy the ride! Book now and enjoy road tripping! Don't forget to come back to us for more deals and discounts on your next trip. 1. No other offers can be clubbed with Vdeals. 2. Bookings made with Vdeals cannot be rescheduled. 3. Vdeals cannot be extended or cancelled. In case of any extension, Volercars reserves the right to charge fee or penalty at it's own discretion.